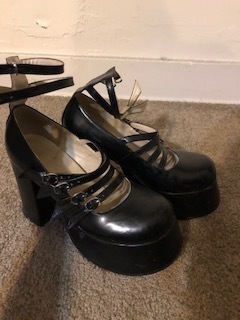 Bought these shoes used a while ago; I adore them but they don't go with my style anymore. 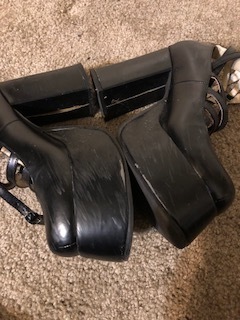 They're in decent but worn condition, a little scuffed which is pictured. Please PM me with questions or for combined shipping rates! Hello, thank you for browsing! Shipping from Ohio, USA I live with two cats, but they don't get near my wardrobe! Please pay within 48 hours of the invoice, or I will have to relist the item. I don't split sets or end auction listings early, sorry about that! I ship all items within three business days of purchase. If you purchase multiple items, I'll only charge you for the shipping of the heaviest item. Feel free to message me with any questions!